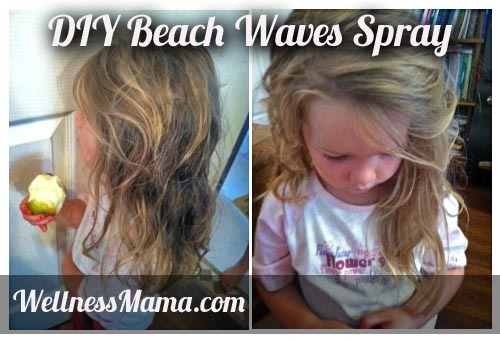 DIY Beach Waves Spray: http://wellnessmama.com/5054/diy-beach-waves-spray/ | mizzeliz – working for you.. This is one of the simplest natural hair care recipes to make at home, and it literally costs about 1/50th of the store bought versions. 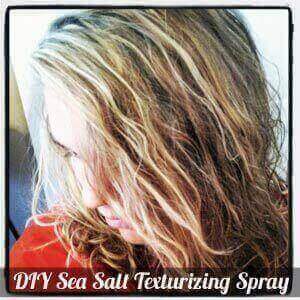 It adds great texture and volume to hair without the chemicals. If you make it yourself, you can also customize to your hair type to get the texture you want. Get a spray bottle that holds at least 10 ounces. I used a glass bottle made from an old apple cider vinegar bottle and a regular spray top. I also tripled the recipe to accomodate the size of my bottle. Put the hot water (or tea) in the spray bottle and add the epsom salts, sea salt (optional), aloe vera, conditioner, scent (optional) and lemon juice/vodka (if using). Put the cap on the bottle and shake for 1-2 minutes or until epsom salts and sea salt are dissolved. Store in the fridge if using lemon juice or tea base, or at room temperature if you aren’t. Will last 3-4 months or longer. If your hair is straight and thin and you want all-day waves: Wash hair the night before and spray hair with Beach Spray while still damp. Then, either french braid into pigtails or wrap in a tight scrunched bun on top of your head. and leave overnight. By morning, your hair should be dry. Spritz with a little more spray and take out the braid/bun. Voila- all day beach waves. Spray with additional spray and scrunch if you want more stiffness.